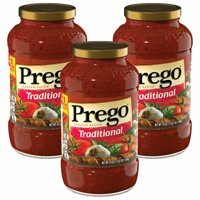 Product Title(5 Pack) Prego Marinara Italian Sauce, 23 oz. Product Title(2 Pack) Prego Fresh Mushroom Italian Sauce, 45 oz. Product Title(5 Pack) Prego Mini-Meatball Meat Sauce, 24 oz. Product TitlePrego Italian Sauce Flavored with Meat Sauce, 14 oz. Product TitlePrego Lower Sodium Mushroom Italian Sauce, 23.5 oz. Product TitlePrego Fresh Mushroom Italian Sauce, 14 oz.